Designing a modern and contemporary style bedroom does not have to spend a lot of money. You also do not need to buy a bed or luxurious furniture and expensive to make the bedroom look elegant.If you are in need of inspiration to make your bedroom look beautiful, and elegant, maybe some contemporary style bedroom design ideas can be your inspiration. As a hibernation room, the comfort of the bedroom is the main factor. In fact, this break room should allow it to be an inspirational space. Especially if united with the working corner. 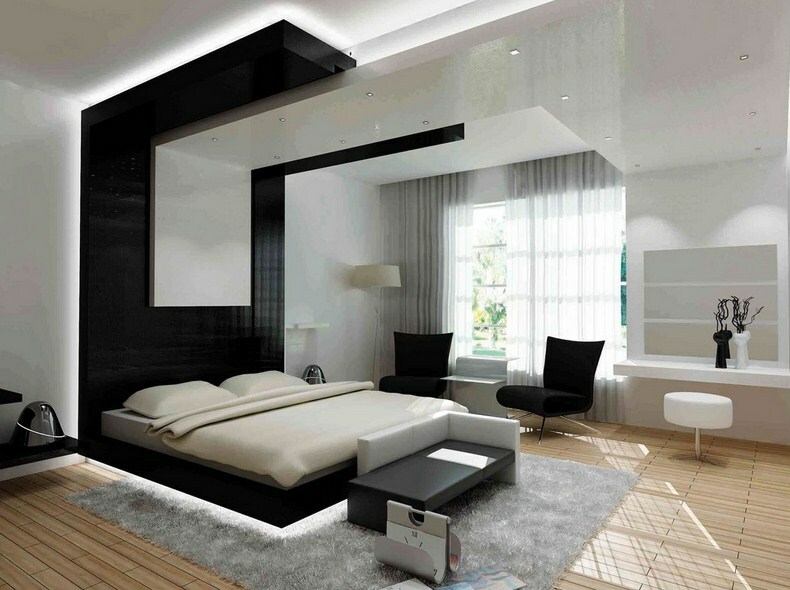 For you who want to design a bedroom with contemporary modern style. Blend contemporary art elements into modern concepts in a 45 m² room area. The goal, in order to create a comfortable circulation motion. Followed by the arrangement of furniture and the division of wall panels based on their respective areas. In the mapping, the sleeping area is made together with the TV area and work area. Whilst a more private area is filled with walk-in-closets and a dressing area connected to the toilet. Grouping this area to facilitate the circulation of the user's movement according to the activities performed. Two wall lamps, plants and elegant furnishings add to the beauty of this room. The thick neutral color in this room gives warmth to the people inside.Choose oakwood wood because the texture is smooth and still accentuate the beauty of fiber in furniture and wall panels. Make a firm and strong statement with a wooden bandage on the wall. As seen in the bedroom design above, the combination of bright wood color and bright colors on the walls, floors, and some furniture, making the room look alive and beautiful.The color selection of furniture should contrast with the color of the walls, but still in one tone of color to look the same. Dark walls and wooden floors give the impression of elegance in this bedroom. Other color combinations such as white, cream, and chocolate further add to the compatibility of this bedroom.The arrangement of furniture and decoration should be appropriate to create a comfortable circulation in accordance with user activities. Speaking of something modern and contemporary is never a limit. So when asked about the contemporary-looking design it feels like a full page of articles will never be enough. For those of you who are still vivid about contemporary, we will try to describe a contemporary art in bedroom design that is certainly spectacular. Can also be a nice alternative for you who want to build a hotel or inn. The hallmark of contemporary rooms is usually large, and equipped with knick-knacks such as paintings, flower arrangements, or colorful wallpapers. If you have another idea for a unique contemporary bedroom design, you may share it with us. Let plenty of natural light through the glass wall.Meanwhile, to create a dramatic effect, create a light game from the drop ceiling by giving the hidden light to warm the atmosphere.